Everyone loves an inspirational story. Overcoming differences, falling in love and fitting in are everyday stories but today I read one about Hazel Soares. 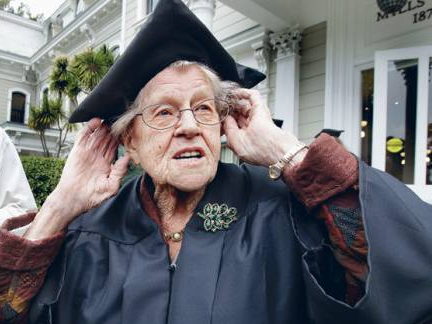 Hazel is a 94-year-old great grandmother that just earned her bachelor’s degree in art history at Mills College in Oakland. She waited until she was 79 to start taking college courses. She spent six years at Chabot College taking classes and finally earned her Associate’s Degree when she was 85. After that, she enrolled at Mill’s College in 2007. Hazel hopes that others realize that it is never too late to go back to school and get a college education. Among other things, Hazel still drives and visits her doctor only once every three years to make sure she’s OK. She also said she doesn’t take any prescription medications. Tagged Bachelors Degree, College Degree, Criminal Justice, Marketing Degree. Bookmark the permalink.